Oron Catts is the director of SymbioticA, the Centre of Excellence in Biological Arts, within the School of Anatomy and Human Biology, The University of Western Australia. Oron Catts is an artist, researcher and curator whose pioneering work with the Tissue Culture and Art Project which he established in 1996 is considered a leading biological art project. In 2000 he co-founded SymbioticA, an artistic research centre housed within the School of Anatomy, Physiology and Human Biology, The University of Western Australia. 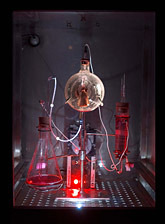 Under Catts’ leadership SymbioticA has gone on to win the Prix Ars Electronica Golden Nica in Hybrid Art (2007) the WA Premier Science Award (2008) and became a Centre for Excellence in 2008. In 2009 Catts was recognised by Thames & Hudson’s “60 Innovators Shaping our Creative Future” book in the category “Beyond Design”, and by Icon Magazine (UK) as one of the top 20 Designers, “making the future and transforming the way we work”. Catts interest is Life; more specifically the shifting relations and perceptions of life in the light of new knowledge and it applications. Often working in collaboration with other artists (mainly Dr. Ionat Zurr) and scientists, Catts have developed a body of work that speak volumes about the need for new cultural articulation of evolving concepts of life. Catts was a Research Fellow in Harvard Medical School, a visiting Scholar at the Department of Art and Art History, Stanford University, and a Visiting Professor of Design Interaction, Royal College of Arts, London. Catts’ ideas and projects reach beyond the confines of art; his work is often cited as inspiration to diverse areas such as new materials, textiles, design, architecture, ethics, fiction, and food. Keynote at the Biopolitics, Society and Performance Conference, Trinity College, Dublin. The Tissue Culture & Art Project, initiated in 1996, is an ongoing research project into the use of tissue technologies in artistic practice. Through the creation of the Semi-Living – a new class of life grown using tissue technology – the TC&A Project probes accepted ideas of life and identity, the concept of self, and the place of human beings in regard to other living beings and the environment. In the current scientific landscape, TC&A plays a valuable role in questioning the new ethics and epistemologies surrounding issues of partial life and the contestable future scenarios being offered. Catts began his research, along with Ionat Zurr, in the School of Anatomy and Human Biology prior to the establishment of SymbioticA. The two were instrumental along with Professor Miranda Grounds and Professor Stuart Bunt in establishing the space for other artists to gain access to the facilities of the School of Anatomy and Human Biology and continue their research as core SymbioticA Artists in addition to mentoring and training other artists in tissue engineering. The Autotroph is part of Adaptation, one of SymbioticA's long-term projects based at Lake Clifton, WA. The Autotroph's initial engineering concept was developed with the assistance of UWA Honours student Ryan Kim. The Autotroph ironically explores the problems and possibilities of ‘solutions’ to climate change and ecosystem devastation. Lake Clifton is a microcosm of the global ecosystem. The lake and its inhabitants, including the Thrombolites, are under threat due to salinity, urban development pressures, global warming and land misuse. The Autotroph is a playful exploration using technology to engineer solutions for the immense complexity of dealing with ecological issues. Any action postulated raises possibilities of good and harm to different aspects of the ecology, and this is without even considering the unknown unknowns (to quote Rumsfeld). The challenge of this project is to tell the stories of these complexities, but not to solve them.